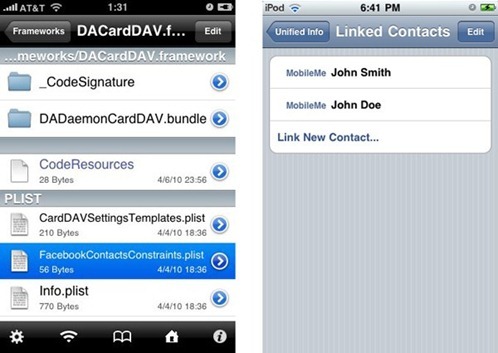 iPhone OS 4 to Bring Native Facebook Integration? If you have ever owned or use an HTC phone like HTC HD2 or HTC Desire with HTC Sense, you will know how great a job HTC has done in tightly integrating the phone with social networks like Facebook and Twitter. This is something that iPhone users have been missing even with three major iterations of the OS. But with iPhone OS 4, Apple is likely to change this all. Digging deep into the iPhone OS 4 file system, Gunning for Safety has found hints that Apple might be integrating Facebook which would (quite possibly) link all your contacts with your Facebook friends/contacts along with calendar events with your iPhone’s Calendar and contacts app. This surely will be a welcome change after all these years when iPhone users had to rely on third party apps (including the risk of jailbreaking the device) to get this basic functionality when others were offering it out-of-the-box. Evidence of iChat Found in iPhone OS 4. Is Video Calling Coming to iPhone HD? Please don't say the “risk” of jailbreaking, there is no risk AT ALL and you run a site dedicated to this stuff. Please please please remove that.